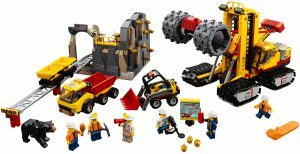 The ‘Mining Experts Site’ set is large (1868g, 857pcs, 6 minfigs) set introduced in 2018. There are many opportunities for all minibuild types large, small, decorative and functional. The first minibuild is ‘#060.188.0100 Geologist (Miner/Scientist) with Earth Imager Ground Scanner/Gold Detector’. This is a 7 part minibuild that comes from bag #1 and with instruction booklet #1, which it shares with four other minibuilds, so the seller will have to complete a inventory check before listing. 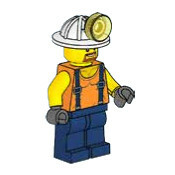 The minifig insignia are not specific Geologist for a mining environment, but generic enough to be a scientist in any other field of science. It is themed as ‘Minifig > Scientist’ and universed as ‘City > Mining’. #~101 is the sub minibuild minifig of #~100, being the Geologist. 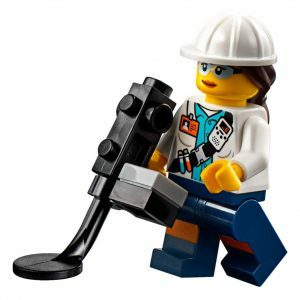 This is a four part minifig with integrated construction hard hat and hair with ponytail. This is in Bricklink as minifig #cty848. 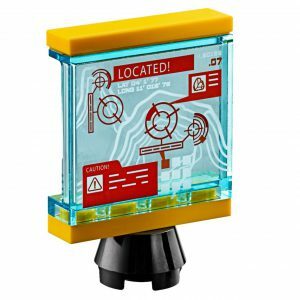 The ‘Gold Detector’ is an obvious minibuild that could also represent an advanced metal detector. Therefore without the two part keypad display attachment it represents a standard (beachcomber) metal detector (#060.188.103, Bricklink #93106). A printed 1 x 1 tile is used to represent the keypad/data screen, on its own it can represent a calculator (#060.188.0104). 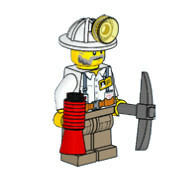 A fully equipped Mining Foreman with red Megaphone/Loudhailer (#060.188.0203, #4349) and dark bluish gray pickaxe (#060.188.0202, #3841). 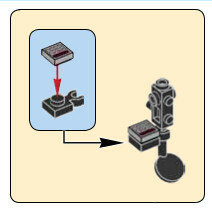 The minifig (i.e. Foreman without tools/equipment) is listed on Bricklink as cty876, minibuild identifier: #060.188.0201. To adapt this to a construction setting, a simple change of the hard hat would suffice. The third minifig minibuild from bag #1 is the Front Loader Operator, a standard tough-looking (the beard gives this away!) miner. With no accessories, tools, nor equipment (no weapons either! ), this minifig minibuild is also its own minifig in its own right. Listed on Bricklink as cty884. 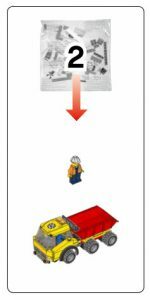 As with the Foreman (#060.188.0200) the hard hat can be changed and the minifig could represent a typical construction worker (a non-conformist who prefers working in his vest!). A freestanding location board with ‘LOCATED!’ mine map is the next minibuild (#060.188.0400). In any city this could represent a ‘you-are-here’ location map. This minibuild is a four part minibuild and uses one sticker: #17 in the gold mine map. Themed as ‘Street Furniture > Notice Sign’, and from the ‘City > Mining’ universe. There are two stickers required on the Location Board, and #11, a black-on-yellow danger stripes for the back of the Front Loader. These come from one sticker sheet in the set. On the whole, a play-worthy set containing three minifigures with accessories; a vehicle (Front Loader) with a raising shovel and tilting roll-cage cockpit play features; and a couple of scene makers (Location Board and Three Gold Nuggets). Buyers will probably expect bag #1 unopened, cut-out stickers (#17 and #11) and instruction booklet #1, which is also an easy pick for a seller. This will not be tagged, themed, or ‘universed’ as its constitute logical minibuilds (see later) are better suited to tags, themes, and universes. A simpler and more ‘complete’ minibuild than #60188-1a is ‘#60188-1b Dump Truck with Dump Truck Operator’. This is a six-wheeled 6-stud wide dump/dumper truck (with is the same scale to a 4-stud wide car) with its driver/operator, officially ‘Dump Truck Operator’. This is a minibuild that would fit well with the construction setting as much as the [gold] mining setting and is tagged, themed, and ‘universed’, as such. This comes from bag #2 and with instruction booklet #2. Just two stickers, the small #13 sticker is the front licence/number plate (there is no rear licence/number plate) and sticker #9 is the mining logo for roof. This minibuild contains two logical minibuilds that play into each other (a dump truck needs a dump truck driver hay? ), so it will be tagged, themed, and universed. The tags will be: miner; gold miner; mine worker; worker; driver; truck driver; construction worker; dump truck; truck; mining vehicle; mining truck; construction vehicle; construction truck; mining; gold mining; construction. Themes will be: Mining > Mining Vehicle; Construction > Construction Vehicle; and, Vehicle > Truck. This minibuild will share the two universes: City > Mining (official universe) and City > Construction. From a play-worthy perspective this is easily a high playable toy minibuild, who young boy (stereotypical I know) wouldn’t loving playing the site drive and tipping out the load. Buyers will probably expect bag #2 unopened, cut-out stickers (#13 and #9) and instruction booklet #1, which is also an easy pick for a seller. It may increase sell-ability by applying the the licence/number plate (sticker #13) because it is small and fiddly, but omitting the application the the mining logo sticker on the roof (sticker #9) as it wouldn’t fit for the dump truck in a construction site setting. The next minibuild plays the ‘cutesy’ card, with the cute (but deadly) stick of dynamite, a back bear (OK, so it isn’t a cub), a spider (glow-in-the-dark no less!) and a chicken drumstick (where did the bear get that from? ).